Discover the heart of the Kingdom of Mourne with me and Stephen Wallace of Hibernia Landscapes - NOW SOLD OUT! Doan is the often overlooked gem tucked right into the heart of the Kingdom of Mourne. It's not the biggest; it's not the steepest; it's not the most imposing. But its diminutive stature belies a photogenic beauty unique in the Mournes. From the summit, you have a compete 360 degree panorama looking up at the taller peaks around. If there is anywhere that makes you feel like you are in the Mournes not just on them, then this summit does. Then there's the views down into the valleys - with the Silent Valley Reservoir stretching away to the south and Lough Shannagh to the west. And, of course, let's not forget all those rugged tors just waiting to provide all sorts of interesting foreground detail. As far as fully immersive Mournes experiences go, this one is hard to beat. At this time of the year, the Sun sets far to the south-west, giving great light over the epic valleys to the south of Doan. And we might even be lucky enough to have a wee drop of snow up top too! This is the start and ending point for the day. Stephen and I will formally introduce ourselves and share with you the plan for the day. We'll start our journey following the Ott track leading towards the Mourne Wall stopping on the way up to photograph down into the Fofanny Valley. Based on conditions we will then decide the best places to stop and in what order (explaining the rationale for that choice). Our options include Ott mountain, Carn, the shore of Lough Shannagh and the slopes of Slieveloughshannagh. During this period Stephen and I will guide you in creating strong compositions and the settings to use to capture a sharp and well-exposed image. We will hike to Doan mountain which has 360 degree views of the High Mournes, Ben Crom reservoir, Silent Valley and Lough Shannagh. Doan will be our sunset location for the day and has a number of compsotiional options and everyone will have plenty of space to find their own shots. We will react to the light (or lack of light!) to help you come away with shots you are pleased with. We begin the journey home, arriving back at Ott car park at approximately 5.15/5.30pm. This workshop is suitable for both beginner photographers right up to those who are more advanced but simply want to be guided to some new and largely unexplored locations to expand their portfolio. A good level of fitness is required for this workshop as we will be walking on uneven ground for approx 6 miles, with reasonable ascents in places. Suitable walking boots and waterproof clothing should be used. As a rule of thumb, prepare to over-dress rather than under-dress as temperatures can quickly plummet on higher ground. You'll need a base layer (t-shirt, long or short sleeved), a mid-insulating layer (warm fleece) and an outer layer (hard or soft shell jacket) for protection from the elements. A waterproof layer is essential. Please also bring a head torch. Whilst it will still be twilight as we begin walking down, closer to the finish it will become dark. How much does it cost and what do I get for that? Group size is capped round 6 people, to ensure plenty of one-to-one tuition. 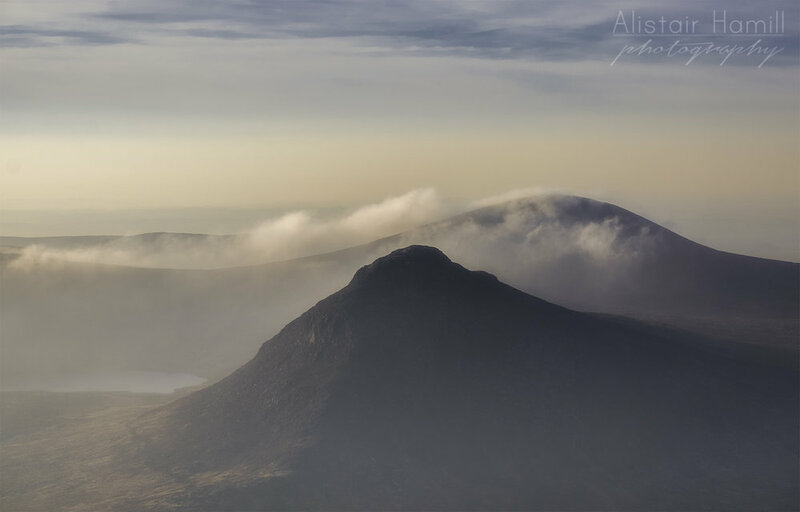 A brand new and totally exclusive Mournes workshop eBook, written by myself, Stephen Wallace and Ryan Simpson. It includes: a collection of our best Mournes photos; a guide to composition and light in the Mournes; background to the history and geology of the place; a photographer's guide to the various summits and valleys of the mountains. This eBook is only available to participants of the workshops. Post production is an important part of the photographic workflow. After the workshop, Stephen or I will offer to take one of your images and do our own post production on it to show you how we would approach this part of the process. You will be sent a video of us doing the editing so you can learn a few Lightroom and Photoshop skills too. Please read my terms and conditions before booking as booking a workshop confers acceptance. Winter workshop at Lough Shannagh and Doan - new date!